Over the past years we have witnessed an upsurge of documentaries that criticize multinational capitalism, such as Robert Greenwald’s Wal-Mart. The High Cost of Low Price and Mark Achbar and Jennifer Abbott’s The Corporation. It would be a mistake, however, to think that after the notoriously apolitical eighties and nineties the Left would welcome this revival of ‘good old’ anti-capitalist critique. Rather, the enlightened Left’s standard reception of the critical documentaries is one of resistance. They are said to bring old news, to expose the excesses of capitalism that have been common currency and common sense for ages. This supposed lack of novelty is then cause to dismiss them as being no longer relevant or topical. The radical activist tone of these documentaries triggers intense reactions. The documentaries are regarded as part of an old Leftist culture and are believed to uncannily resurrect a long superseded, dubious subject position – the conspiracy personality. This type of personality is always on the lookout for a supreme external force that can be blamed for all the world’s evils. If it cannot readily find a force, it will invent one. In short, documentaries critical of capitalism seem to take a stance that is often rebuffed with the rejoinder that turning back the clock to the pre-industrial age is hardly an option. It is symptomatic of today’s Left – whether it is characterized as third way, postmodern or enlightened – that it receives the current revival of anti-capitalist critique with scepticism. Joseph Stiglitz, for instance, is quite critical of global capitalist institutions like the World Bank and the International Monetary Fund (IMF). In formulating his critique, however, he always makes a point of emphasizing that he does not attack global, neo-liberal capitalism per se, but merely its too rigid, ideological application. Consequently, Stiglitz’s alternative does not propose to destroy the capitalist world order as such, but to better manage economic globalization. This management is presented as the surest way to cause a trickle-down of the benefits of capitalist development to the poorest of the earth’s population, and thus secure the prosperity and happiness of the global community in the long run. It should be clear from Stiglitz’s position that at the heart of the new Leftist imaginary is the fantasy that one can have it both ways. That is to say, one can be straightforwardly capitalist and a convinced socialist, one can ruthlessly pursue accumulation for accumulation’s sake and serve the interests of the largest group possible, help the environment and stimulate democracy and freedom worldwide. Critics and economists, activists and business leaders increasingly share this fantasy, which causes a remarkable and often hilarious reversal of their traditional positions. On the one hand, activists adopt business models as the ultimate panacea – micro-loans for third world entrepreneurs, a stock exchange in CO2 emission quota to solve global warming. On the other hand, economists like Hernando De Soto or C.K Prahalad passionately argue how the poor South will save multinational capital since investing in ‘poverty markets’ is the only way for corporations to remain competitive and in business. The ideological effect of this mutual courting is the same, however: it reinforces not only the belief that capitalism is here to stay, but also feeds the deep conviction that a real revolution of our way of life can only come from the inside, that is, in close co-operation with multinational corporations and sometimes even spear-headed by them. In short, capitalism is affirmed more than ever as the inevitable partner in addressing the challenges that civilization will meet with. Is this Leftist optimism yet another manifestation of the cynicism of our age? The cynical activist knows very well what goes on in the world – that the wealth and prosperity of one half of the planet is based on the misery and destitution of the other – yet acts as if unaware and maintains that it suffices to manage this disparity in a more inclusive fashion. The current series of critical documentaries is met with the same cynical attitude. In an age in which reports and testimonies of the worst excesses of global capitalism are readily available through different media – a time, in short, in which we are ever so well-informed about economic, political, social and ecological malpractices around the globe – the Left, strikingly, has never been so passive about effecting a deep, fundamental change. Indeed, the abundance of anti-capitalist documentaries does not seem to generate radical action. On the contrary, it seems to produce ever more sophisticated ways of legitimizing passivity. Consider the common argument against consumer boycotts. Even persons critical of capitalism dismiss the refusal to buy a cheap T-shirt made in Nicaraguan sweat shops by children or exploited women as too simple, as failing to grasp the true complexity of the situation, since, they argue, this refusal deprives the workers of the only income they have, which might seem a trifle to a Westerner, yet is a matter of life or death in Nicaragua. This argument is exactly the one that the corporations that ruthlessly exploit these people avail themselves of. Such cynical resistance prevents people from conducting a collective thought experiment that goes beyond the existing co-ordinates of capitalism and beyond the utterly conservative consensus that a market-style organization is the tried and tested way to organize all aspects and dimensions of society. Today’s cynical Leftist reasoning – however well disguised as an optimistic reformism – is themain obstacle to beat the current deadlock and create a mental break that will give room to invent and test out other scenarios and models. Against the current, one should assert the radical position that capitalism is such a perverse force that even witha better management, with the incorporation of democratic, ethical or ecological concerns, it will time and again pervertthose values. In other words, one should assert that the key mover of capitalism, profit for profit’s sake, will always put a damper on finding a really satisfying, sustainable and emancipatory solution for today’s problems. In his book After Liberalism Immanuel Wallerstein pleads for precisely such a radical denouncement of the supposed merits of capitalism. He frontally attacks the consensus that capitalism undeniably has brought welfare to larger parts of the world. It concerns the common idea that capitalism – although far from perfect – at least delivers the goods and has secured the quality of life for a huge number of people. Wallerstein urges us to radically oppose capitalism’s sense of superiority that presents itself as the final stage of history. He reminds us that these so-called achievements show black edges since billions of people have been taken advantage of and forms of cultural life eradicated. Wallerstein even coined the term “democratic fascism” to describe the current global capitalist order, in which the populations of a small number of pre-dominantly Western nation-states can sustain the utopia of high consumption levels and democratic liberties by plundering and exploiting the rest of the world, by maintaining a gigantic global disparity in wealth, opportunities and rights. Marx’s insistence on the non-essential relation between capitalism and human progress has not lost any of its topicality. For sure, Marx admired capitalism because it subverted the feudal, hierarchical social order, it made productivity levels increase through co-operation and internationalization, it ‘melted everything that was solid into air’. The new Left never tires of dishing up this argument to legitimize its endorsement of capitalism as part of the solution. Nevertheless, Marx fiercely resisted the identification of the utopian, emancipatory forces unlocked by the industrial revolution with the capitalist mode of production. According to him, the revolutionary potential of industrialization was ‘hacked’ by the capitalist class that abused it to gain self-enrichment and legitimize its privileges. Even today it is the crucial task of the Left to disconnect the advances made by revolutions in the means of production from the capitalist class model of society. It is precisely such an act of disconnection that Antonio Negri and Michael Hard perform in Empire. They argue that the post-industrial, network-style of co-operation and production should be divorced from its current state of monopolization by multinational capitalism. Stiglitz, for instance, holds the idea – shared both by capitalism’s advocates and critics – that capitalism is a constantly revolutionizing, ‘deterritorializing’ force that needs to be checked and carefully managed so as to distribute the advances and benefits evenly. Conversely, Hardt and Negri hold that it is capitalism itself that constantly puts its foot on the break and shuns away from the emancipatory potential unleashed by the new network mode of production. 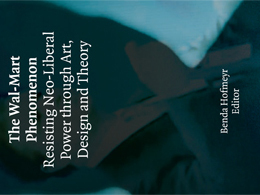 By revealing this inherently conservative tendency in capitalism, Hardt and Negri open up a space where it is necessary, at least for progressive forces, to imagine a global network society without capitalism – which goes against the dominant viewpoint in Leftist circles of capitalism as an ‘inevitable partner’. Global capitalism’s bad taste is dished up unreservedly in Robert Greenwald’s documentary Wal-Mart. The High Cost of Low Price. In thrilling sequences the documentary bombards the audience with all the evils and excesses of multinational corporations, confronting it with the flipside of today’s neo-capitalist utopia. The documentary’s strong point is that it does not merely show how global firms like Wal-Mart wreak havoc in the third world, but also how it touches the United States, the heart of the ‘first’ world. It shows how it makes American communities proletarian, plunders their public assets, pollutes their environment. This rearing of capitalism’s ugly head in its own backyard, in places where the pangs of capitalism were supposed to have faded away for good, is no doubt part of the process that Slavoj Zizek calls “auto-colonization”: the moment when a multinational firm “cuts the umbilical cord with its mother-nation and treats its country of origin as simply another territory to be colonized”. This process of self-colonization is clearly shown in Greenwald’s documentary. We come to understand how America’s Main Street, the icon of American social and economic virtues, is destroyed by the ruthless profit-seeking of an ‘all-American’ firm like Wal-Mart. In this sense, the documentary strikes a painful blow at the neo-capitalist myth and hits capitalism’s heartland where people are bred and fed by its articles of faith. Some critics will undoubtedly argue that these processes are hardly new, that there is little merit in dishing up the same well-known and well-documented truths of capitalism yet again. This is not a reason to dismiss Greenwald’s documentary, however. Its main strength is precisely that it confronts the audience with the fact that, despite the rhetoric, the ‘new’ capitalism, with its concern about social, ethical and ecological issues, is but old wine in new barrels. By doing so, Wal-Mart. The High Cost of Low Price goes against the claim of today’s third way ideologues that present-day capitalism – enlightened capitalism, increasingly conscious of its own limitations and internalizing more and more of its conditions of possibility – is qualitatively different from what came before and can thus no longer simply be dismissed by outdated critiques. The merit of the documentary is that it, on the contrary, documents the eternal return of the laws of capitalism as formulated by Marx and generations of Marxists since. It shows that if there is anything different at all about today’s capitalism, this difference concerns its ever more clever and creative ways of exploiting society for its own reproduction. For this reason, it is precisely because everybody knows capitalism’s malpractices all too well and is weary of hearing them – just like the critics are tired of imputing them – that they should be repeated again and again. Greenwald’s documentary achieves precisely this. It immerses the viewer in the excesses of multinational capitalism, bringing him/her to the point of vomiting. It is an effective, albeit extreme, way to cure today’s subject’s addiction, its passionate attachment even – to borrow Judith Butler’s notion – to capitalism and its claim that it and it alone offers the only real alternative to the many problems we are presented with. What, then, are these eternal laws of capitalism that are brought to the fore in Greenwald’s Wal-Mart. The High Cost of Low Price? First, the documentary reaffirms that capitalism can only reproduce itself by betraying its own ideology of free competition. In other words, it reveals that global capitalism is more than ever a monopoly capitalism, that it rests on the increasingly clever ways of capitalist firms to use their sheer size in order to outgrow and outdo all competition and secure an increasingly larger part of the market. It thus proves, once again, that the myth of the free market is in reality but a farce, a pleasant-looking front that hides a ruthless struggle ruled by underhand tactics and abuse. Perhaps the ultimate evocation of the way super-size companies like Wal-Mart use their power to out-market smaller enterprises is the infamous shot of an abandoned Wal-Mart superstore behind which another one is being constructed. In a condensed way, this image visualizes Wal-Mart’s tactics to physically block other shops from taking up position in the market by occupying strategic locations in American cities with its shops and parking lots, even if this implies building an entire new shop a mere stone throw away from the old one and leaving the ‘old’ shop vacant. Secondly, Greenwald’s documentary reveals that capitalism depends on other non-capitalist social formations to survive, thereby proving the myth of capitalism as an autonomous, self-solvent force wrong. The documentary shows, through a myriad of cases, that multinational companies such as Wal-Mart secure their growth by externalizing as much basic operating costs from its budget sheets as possible or, as Wallerstein puts it, by “socializing the costs, and privatizing the profits”. The documentary shows that Wal-Mart blackmails local governments into offering them all kinds of benefits and tax benefits – the ‘welcoming package’ – by threatening to build their shop in the adjacent town, which they do anyway when they are asked to keep their end of the bargain by moving their shop across the municipalities’ borders. Perhaps the most perverse instance of this process of externalization is the way Wal-Mart makes the State pay for basic expenditures of their employees such as health care or pensions. The perversity is that social welfare – traditionally a redistribution of taxes to those who are negatively affected by the cyclical movements of capital – is now used by multinational firms as a way to keep wages low for competitive purposes. This clearly exposes the hypocrisy of corporate capital’s aversion to a strong welfare state, arguing that the hidden arm of the market will level all disparities in wealth. Against this, one should argue that global capital cleverly abuses the very social security measures it ideologically denounces to survive materially. In short, contrary to what corporate adepts make us believe, it are not the unemployed but big capitalist firms like Wal-Mart that are free-riding the system. Neo-liberalism is thus not simply a pro-business, anti-state constellation. It is a new, hybrid, perverse condition in which state and market complement each other. In this regard, we should not see the state as only or simply a victim of the current neo-liberal ideology offensive. The state also increasingly functions as the latter’s ‘willing executioner’ by making welfare provisions insufficient, which forces people to do low-paid jobs without any perspective, by making a job a precondition to get welfare. The state is thus gradually becoming a partner in crime of neo-capitalism, a provider of a cheap and docile army of labourers for corporate capital. How can Wal-Mart get away with such straightforward social violations? How does Wal-Mart manage to hide these inconvenient truths since, as the saying goes, one can fool some people all the time, all people for some time, but not all people all the time? In Greenwald’s documentary an employee states that when you work for Wal-Mart, “you put the blindness on, you don’t want to see”. How does Wal-Mart produce such blindness in its employees? Wal-Mart uses all the familiar ‘hard’ techniques to neutralize criticism. It applies such practices as union busting, uses illegal labour and enforces sexist and racist hierarchies, which again proves that very little is new in contemporary multinational capitalism. Also, significant material interests are at stake, which distort or even censor critical awareness of the inconvenient truths behind Wal-Mart. In one scene, for instance, a woman with a full shopping cart claims she is not aware of the poor working conditions in which the goods are made. By ruthlessly exploiting the phantasm of the bargain – ‘get more for less money’ – nursed by marginalized classes that for too long have been exempted from consumption, Wal-Mart establishes an intricate relation of complicity with its victims. The sad thing is that precisely those people who are most likely to bare the brunt of Wal-Mart’s exploitation techniques are the ones who, for obvious reasons, uncritically shop at Wal-Mart. Most fascinating with regards to Wal-Mart’s capacity to neutralize any criticism is the personality and discourse of Wal-Mart’s Chief Executive Officer Lee Scott, who is shown on several occasions in Greenwald’s documentary. The type of guy he is, or pretends to be, is telling. At an annual meeting of employees, that announces the results of the company, Scott seems embarrassed and uneasy when he receives a standing ovation. He begs the audience to stop applauding, seemingly unwilling to take credit. This act of feigned modesty continues when he stresses that Wal-Mart’s hard-working employees, and not himself, cause the business’ success. Scott assumes the role of the vehicle, the messenger boy of the good team performance. Consequently, Scott constantly uses the first person plural: we made big profits, we beat the competitors. Apart from being strategically modest, Scott shows himself master of euphemism. He consistently refers to his employees as ‘associates’ or even ‘friends’, thus creating an atmosphere of amicability, equality and profit-sharing. Also, employees are named and classified according to an elaborate hierarchy of management functions such as receiving manager, operation manager, merchandise manager, etc. This ultimately creates the illusion that a job is more than just a mind-less, bottom-end job without any perspective. By using managerial terms it is suggested that the job requires invention, thinking and taking responsibility. It also simulates job mobility and professional specialization. Apart from using euphemisms – typical of neo-liberalism in general – Scott is a skilled spin doctor who constantly manipulates the facts to his own benefit. In the annual meeting mentioned earlier Scott urges his employees “to be ready to do better”. Considering the already excessive workload of its employees, such prompting could cause offence. He cleverly argues that “for whatever reason, whether it’s our success or size, Wal-Mart Stores Incorporated has generated fear if not envy in some circles”. It is obvious that Scott, by using terms such as fear or envy, downplays every criticism levelled against Wal-Mart as the result of some pathological, irrational reaction to the firm’s success. Similarly, he dismisses the local activist groups that campaign against the coming of a Wal-Mart in their neighbourhood as a “small minority”. He makes the activists’ protest seem undemocratic, a matter of a few people taking the many pro-Wal-Mart citizens hostage who are eager to benefit from the bargain prices. Perhaps the ultimate cunning of Wal-Mart’s CEO concerns his cleverly alternating between an enlightened, politically correct position and a blunt neo-liberal stance. Scott constantly talks about ‘doing the right thing’ and, as if he anticipated Greenwald’s critical documentary, asserts the very values Wal-Mart is accused of transgressing. He focuses on family values, small communities, jobs with profit sharing and opportunities for personal development, sustainability, even the poor. In short, the CEO is the proponent of global capitalism that has incorporated all the values of its critics and promotes them with missionary zeal. Scott even encourages his employees and customers to “tell the Wal-Mart story”, which uncannily repeats Greenwald’s own characterization of the aim of his documentary as “a tool to pass the story on”, the story of the excesses of Wal-Mart. Wal-Mart’s hacking of the values of its opponents is, however, more than simply a way to neutralize the latter by robbing them of their ammunition, or to hypocritically paint a brighter picture of itself. It is crucial to understand that references to family are structurally necessary to make Wal-Mart function. As we argued earlier, Wal-Mart has to think highly of family or community networks of solidarity – or rather pretend that it does – because it feeds on them; it is a way to reduce the costs and keep wages low. In this sense, one can say that Wal-Mart’s CEO is also sincere when he talks about the family or local community – although this sincerity is as perverse as it is hypocritical. The Wal-Mart story is thus not ‘merely’ ideology, a way to hide the ‘real’ laws of capital – it reflects a ‘hard’ law of Capital itself, the dependence of capitalism on non-capitalist social formations for its reproduction. Highly revealing for capitalism’s dependence on the Other is the appendix in Margaret Thatcher’s famous motto that “there is no such thing as society, only individual men and women… and their families”. The neo-liberal universe of individual, atomized beings that strive to maximize their inner potential always depends on its opposite: the non-reciprocated and unselfish solidarity between human beings. We agree with Immanuel Wallerstein when he says that capitalism’s ultimate doom scenario is, paradoxically, that of a fully commodified society, since it would have to pay the full price for services it now ‘farms out’ to families and other local solidarity networks. Scott enthusiastically defends the same progressive arguments his opponents use and refers to economic mechanisms as if they were laws of nature. Scott dryly states that raising the average wages of the employees would have a negative effect on profitability and disappoint stockholders “disproportionately”. At this point, the Wal-Mart CEO’s progressive mask drops and he turns into what Slavoj Zizek calls a crook, “a conformist who takes the mere existence of the given order as an argument for it”. Scott’s assertion of the laws of capital is not simply a slip of the tongue, a last resort when the mobilization of progressive values fails and he is no longer able to put up a front. It is crucial to see that the secret of the CEO’s discourse success lies in his use of both tactics at the same time. Or, in other words, the constant mix of progressive and cynical arguments creates a structurally instable position. Is Scott a progressive, enlightened entrepreneur or a corporate crook? This ambiguity makes it very difficult for critics to oppose Wal-Mart. They cannot simply go up against Wal-Mart for violating the values that are dear to them and that are already fully incorporated in the ‘Wal-Mart story’. Inversely, every attempt to prove that Wal-Mart in fact merely dishes up an eroded version of these values or makes a travesty of them, is met with the rejoinder that, with all due respect, one has to consider basic and natural economic laws such as profit-seeking. It is clear that, faced with such a ‘capitalist crook with a politically correct face’, anti-capitalist critics will have to come up with special tactics if they want to checkmate corporate capitalism. Hitherto we have perhaps uncritically dealt with Greenwald’s documentary, focusing more on the case against Wal-Mart presented by it, giving our own presentation and interpretation of the materials presented rather than focusing on the documentary itself, that is, its method, tactics, form and style. The documentary, for instance, does not tackle Wal-Mart’s CEO’s split discourse as such, only juxtaposes the CEO’s progressive statements with the ugly truth behind them, revealing their sheer hypocrisy. Each chapter begins with a statement of the CEO, the obvious lie of which is revealed in what follows through an array of evidence. In this sense, Wal-Mart sticks to the standard truth procedure of unmasking and demystification, the revelation of the split between the appearances and the facts, between the official discourse and its obscene hidden message, between the rhetoric and murky reality. In this respect Greenwald’s approach differs from that of Michael Moore. Moore’s films, rather than directly showing the truth, portray the main character looking for the truth. The author is included in the picture and tries to get to the truth by confronting the enemy. In this sense, the documentary is not so much about the truth as such, but about the quest for the truth. A postmodern audience will no doubt dismiss Greenwald’s simple procedure of unmasking as an anachronism, a remnant of a modernist culture of suspicion that believed it was the subject’s duty to expose false appearances. To basic truth procedures more complicated ones can be added. One can – as we did with the Wal-Mart CEO – direct the critique on the level of discourse and reveal how underlying mechanisms cause all kinds of twists, distortions and strange formulations in the official discourse – a return of the repressed as it were. Such a symptomatic reading reveals how the dirty facts are reflected – and can as such be found – in the Wal-Mart discourse. This critical strategy occurs once in the documentary, in a fragment of a television show in which the presenter reacts to an isolated statement of Scott who in an interview dryly states that “it is our policy that we pay everyone for every hour worked” – obviously in response to allegations of Wal-Mart’s massive abuse of working over-time. Instead of simply denying the allegations, the official register of the response betrays bad faith. The CEO seems to use diplomatic discourse, carefully choosing his words, using stock expressions, saying the bare minimum to convince the other party or soothe public opinion lest things can be used against them. In Scott’s case, the careful phrasing of his response to the accusations – carefully phrased in terms of Wal-Mart’s official policy, which still leaves the door open to abuses of the official line in practice – is the sign of his lying. If the allegations were really unjustified, he would have denied them much more resolutely. Another tactic common in critical documentaries is to refrain from unmasking the words of the opponent as false but, on the contrary, to take his/her words and promises dead seriously. The latter strategy is to use the ideals and values that Wal-Mart has to mobilize to legitimize its activities as a leverage to force it to implement them. Think of the famous scene in Michael Moore’s Fahrenheit 9/11 in which the latter, as a true freedom fighter, urges pro-war members of the U.S. congress to set a good example and send their sons and daughters to Iraq to defend freedom and democracy. The subversive effect of Moore applying the war discourse more rigidly than its advocates, is created by provoking the opponent to betray his own articles of faith by asking him/her to abide by them, by asking the opponent to put into practice what s/he preaches. The congress men who Moore harassed, all strong defenders of the war, came up with all kinds of lame excuses for not sending their sons or daughters to Iraq. The lack of more subtle and complex critical procedures in Greenwald’s documentary, its use of no-nonsense truth techniques, can be seen as a fatal shortcoming. By pretending to have direct access to the truth, to be omniscient about the dealing and wheeling of Wal-Mart, and by merely presenting his own right Greenwald makes the audience into passive, ignorant, apathetic beings, or ‘stupid white men’ – to refer to the book title of another documentary maker, Michael Moore, who often receives similar criticism. To a postmodern, enlightened public who hates to be lectured by some all-knowing authority figure, such truth procedure will be discarded as patronizing and moralizing but also as ineffective, since the audience is not incited to think for itself, but merely swallows a ready-made truth prepared by the documentary maker. True though this criticism might be, there is still something pathological about it. It is the typical response of the enlightened subject who argues that it is already all too familiar with the message. Still – and this is the crucial point – this very admission of knowledge on the part of the subject, of ‘knowing all too well’, of ‘having heard it all before’,feeds a feeling of superiority, of self-sufficiency that functions as an excuse for not changing its lifestyle. The form of Greenwald’s documentary is equally criticized. Its cheap, commercial aesthetics trigger derisive reactions, as does the high degree of authorship, the ‘hidden hand’ of the documentary maker who stages everything to palm the message off on to the audience. Think, for instance, of Hito Steyerl’s critique in this volume of the recent upsurge in popular, anti-capitalist documentaries, which she calls a “Wal-Martization of documentary practices”. She argues that Greenwald’s documentary is highly critical on the level of content, yet “offers hardly any resistance on the level of form”. Also, Greenwald’s characterization of his documentary as a “tool to help the story”, as something which “in itself will not change things, but will do so through those who will use it as a tool”, will be highly contested as an assault on the documentary genre’s autonomy, as the instrumentalization and even insubordination of documentary making to a political agenda – and hence a regression to mere propaganda. Again, these arguments sound strangely out of tune, normative even, as it seems to subject the entire documentary genre to a deconstructive aesthetics in the manner of David Lynch. In cultural studies it is commonplace to endorse the method of the latter as much more critical due to the author’s self-effacing, to the extreme degree of merely offering complex and contradictory fragments the audience can endlessly construct their own narratives or truths with. Needless to say, the contemporary subject is more at ease with an open, ‘free’ style. The subject is treated as the author’s equal or even as the author him/herself. Things, another argument goes, are much more complex than the documentary shows them to be. The documentary deliberately reduces and hides this complexity in order to sell its political agenda. Against this we should argue that within a socio-political struggle precisely this critical-deconstructivist attitude obstructs any politicization since it endlessly defers a final judgment by fetishizing the irreducibly complex state of the world. One reverend in the Wal-Mart documentary claims that everybody has mixed reactions rather than straightforward opinions vis-à-vis the scandalous practices of Wal-Mart. Is the constant ambivalence that is expected of the discourse in documentaries not similar to the hardly straightforward official Wal-Mart discourse itself – as is revealed in the discourse analysis of Wal-Mart CEO Lee Scott? It is the merit of recent critical documentaries such as Wal-Mart that they do away with endless suspension of judgment and action and force the audience to make up their mind and act, and overcome the cynical deadlock in which the Left finds itself today. For this reason, we should refrain from applying the dogma of deconstructive film to the activist documentary genre. We should rather conceptualize how truth is produced and functions as part of bigger political struggle. This is Jacques Lacan’s quilting point, the magical point in which all the different, fragmented, contradictory experiences of a situation come together, are ‘pinned down’, and cause the subject to grasp this situation, to retroactively construct its hidden logic and meaning. With regards to the Wal-Mart documentary it should be clear that the video, by presenting in one sequence all the diverse, fragmented experiences and stories of those duped by the company, allows the deceived and the audience to experience the ‘Wal-Mart phenomenon’ as such and grasp the systematic character of its strategies of exploitation. In other words, by bracketing the complex, multi-faceted experience of Wal-Mart, Greenwald’s documentary opens up the possibility of resistance. The function of the Wal-Mart documentary as truth procedure brings us to the use of reactionary – or what is so perceived – structures and feelings in Greenwald’s documentary to reveal the ills of the Wal-Mart corporation. Especially among European audiences this is often seen as problematic. The documentary shamelessly uses very American themes such as the entrepreneurial citizen who took risks and single-handedly built up his business from scratch. The documentary shamelessly exploits the American dream, using pathetic songs by Bruce Springsteen – undoubtedly the voice of hard working, self-made America – and lyrics such as “this land is your land, this land is my land, this land was made by me”. In this way, the documentary easily juxtaposes big, corporate, multinational capitalism and local, small-town capitalism having its base in hard working community at the heart of which are shops and enterprises on Main Street, where owner and buyer, employer and employee, know each other’s names and share the same life-world, where bosses throw Christmas parties for their employees. The latter is, of course, a retrospective myth, the fantasy of a socially and locally embedded capitalism that conceals the fact that earlier family enterprises were equally based on exploitation, that the local shopkeepers also profited from cheap and docile family labour. The difference, at most, is that this form of exploitation was ‘kept in check’ by the community’s values, by the fact that the exploitee had direct contact with the exploiter – which makes it transparent to the participants and seemingly more honest. Today, conversely, one feels ruled by abstract market relations and the obscure movements of shareholders ‘out there’. Apart from this patriotic theme in Wal-Mart, the blatant religious edge given to the resistance to Wal-Mart will no doubt cause a postmodern audience to frown. In the documentary, the most passionate attacks on Wal-Mart are shown to come from the side of religious organizations. The latter are put forward as most antagonistic and radical in their opposition. We see reverends coining terms like ‘plantation capitalism’ and comparing the local communities’ struggle against Wal-Mart as a case of David versus Goliath. This presentation of religion as the ultimate site or vehicle of protest is, of course, all but unproblematic. It should, for instance, be clear that religion is in the first place a moral discourse, essentially driving on moral outrage, as opposed to a political discourse, which is based on a systematic analysis and critique of the mode of production. For this reason, it seriously limits the resistance struggle, contenting itself, as it does, with ensuring that everybody has what s/he needs to lead a dignified human life. Or, as a reverend puts it in the documentary, “the Bible says that the love of money is the root of all Evil, not that it (money) is all evil”. In short, a religiously driven resistance movement will seldom draw the radical conclusion that multinational capital does not merely produce immoral side effects that can be checked by a better management, but that there is something perverse in Capital as such, which will never go away and will always cause human misery and destitution. Such movements of moral indignation can therefore easily be recuperated by today’s ideology of corporate responsibility that propounds that enterprises should not be ‘all’ about profit, but also that they should also take other factors into account such as ‘people’ or ‘earth’. All these patriotic or evangelist overtones will no doubt reinforce the conviction of Greenwald’s critics that his, as well as other, recent critical documentaries, such as those of Michael Moore, somehow suffer from the same disease as the one they oppose, that they are somehow complicit to, and reinforce the same reactionary logics and mechanisms as those of the dominant culture they criticize, making them no different from the religious patriotism of G.W. Bush. We can see this conviction also as the basic thrust of the two criticism we dealt with earlier, that is, its direct access to the truth and its use of a populist, commercial, corporate aesthetic. Also here, one will argue that on the level of tactics or form, documentaries like Wal-Mart. The High Cost of Low Price corroborate with what they condemn and attack on the literal, narrative level. In other words, documentary makers like Greenwald are accused of not only of ‘Wal-Martizing documentary practice’, as Steyerl puts it, but also of Wal-Martizing anti-capitalist resistance as such. How are we to assess Greenwald’s use of such dubious references to small-town American capitalism or reverend outrage to support his case and mobilize his audience into resisting Wal-Mart? The crucial factor in deciding this concerns the question as to what audience the documentary mainly wants to address. The audience is obviously in the first place an American one. Thus, the mobilization of feelings of patriotism is no doubt done in order to address and convince the American audience that is notoriously apolitical and uncritical of capitalism. The same goes for the religious edge of Greenwald’s documentary, which should be seen primarily as a strategic choice: religious sentiments and feelings of outrage are provoked to establish criticism against capitalism. Only to anti-capitalist purists will such strategic use of patriotism and religion be seen as a betrayal of the good cause – condemning religion as ‘opium for the people’ or the nation as the historical ally of capitalism. However, as Zizek puts it, sometimes one needs to be unfaithful to one’s beliefs, in order to be faithful to them. In fact, sometimes the only way to be faithful to them is to betray them. Or – as Fredric Jameson put it – when faced with a seemingly reactionary social formation, it is always a matter of isolating the utopian, subversive core of a certain ideological constellation, assuming that even the most reactionary ideology contains a progressive core. Think for instance of the American woman at the end of Greenwald’s documentary who raises the American flag at her house, singing a pathetic song of praise on the value of liberty. Although this scene can easily be attacked as yet another piece of evidence of the natural, pathological patriotism of the Americans, it is crucial to note that the scene ends with the woman’s claim that free choice includes the right not to want a Wal-Mart in her neighbourhood. What we encounter here is the same ‘short-cutting’ of the progressive and regressive components of a social formation as in the Americans opposing the war in Iraq because of its betrayal of everything good and emancipatory that America stands for. Today, there is no resistance movement that can afford not to capitalize on the subversive core of the predominantly nationalist and religious ideologies in its context, in order to construct an alternative hegemony. Not to do this, would condemn capitalist resistance to a state of marginalization or abstraction. Stiglitz, J. (2002). Globalization and its Discontents. New York: Norton. Prahalad, C.K. (2005). The Fortune at the Bottom of the Pyramid. Eradicating Poverty through Profits. Upper Saddle River, NJ: Wharton School Publishing. De Soto, H. (2000). The Mystery of Capital: Why Capitalism Triumphs in the West and Fails Everywhere Else. New York: Basic Books. Wallerstein, I (1995). After Liberalism. New York: The New Press. Wallerstein, I (1983). Historical Capitalism with Capitalist Civilization. London: Verso. Negri, A. and M. Hard (2000). Empire. Cambridge, MA: Harvard University Press. Slavoj Zizek, S., (1997). “Multiculturalism, or the Cultural Logic of Multinational Capitalism”, in New Left Review, September/October, 225. Zizek, S., (1997). “Multiculturalism, or the Cultural Logic of Multinational Capitalism”, in New Left Review, September/October, 225. Wallerstein, I., (1983). Historical Capitalism with Capitalist Civilization. London: Verso. Zizek, S., (1999). The Ticklish Subject. London: Verso. Jameson, F., (1981). The Political Unconscious. Ithaca, NY: Cornell University Press.